Snorkeling is perhaps the most popular — and quintessential — Hawaiian activity. 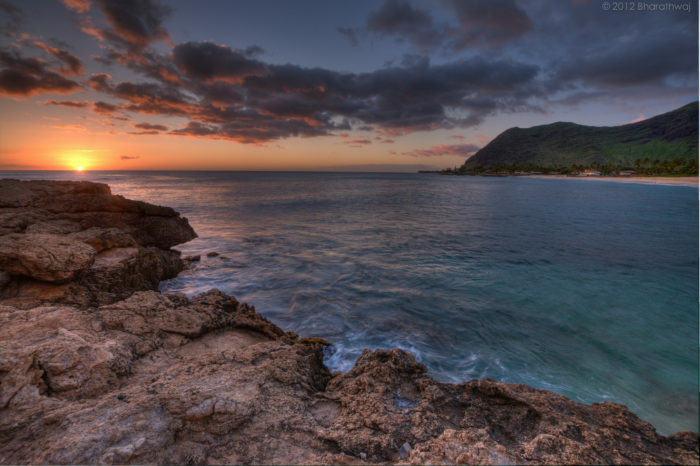 With warm water and islands surrounded by magnificent reef ecosystems, Hawaii is a snorkeler’s paradise. However, if you’ve never done it before, snorkeling can seem daunting. 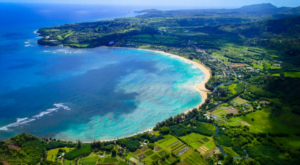 But you’re in luck because there are countless beaches and bays across the Hawaiian Islands that are perfect for snorkelers of any skill level — including beginners! 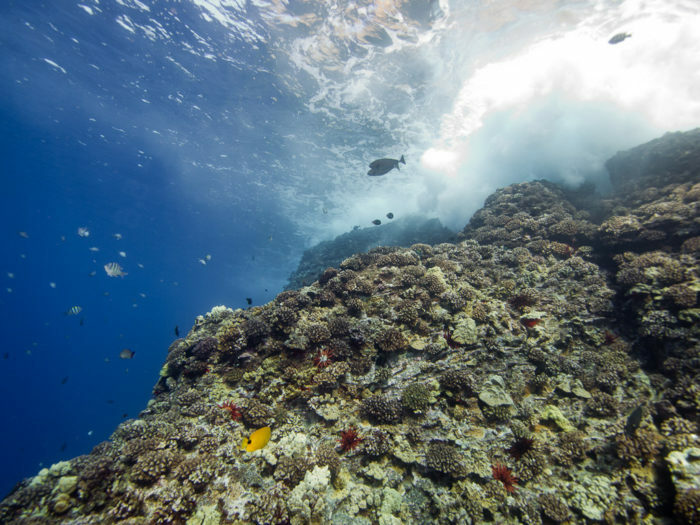 Before we dive in, we need to issue a short warning: please remember that you are a visitor in the vast Pacific Ocean; you should never disrupt the living coral, or bother sea life. Disturbing endangered animals like the Hawaiian monk seal and the honu is illegal and may result in massive fines. As always, we suggest you check out surf conditions before you make any decisions, and head warnings posted at these popular spots. 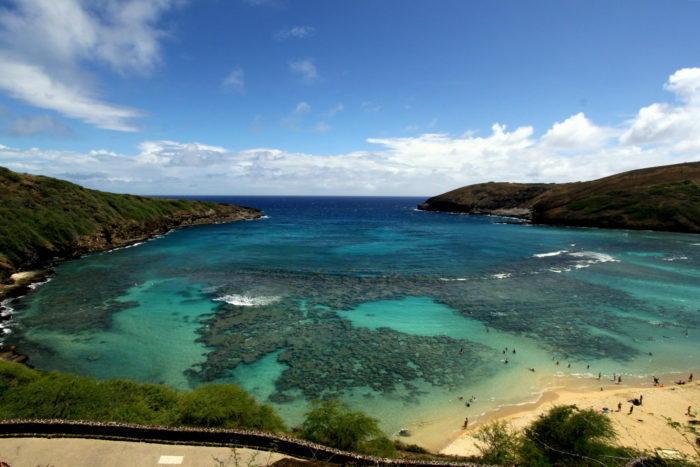 Formed within a volcanic cone along Oahu’s southeastern coast is the wildly popular Hanauma Bay, which welcomes approximately 3,000 visitors each day and is one of Hawaii’s most visited tourist attractions. An estimated 400 species of fish live in the gentle waters of this picturesque bay, and luckily, renting snorkeling or diving equipment is easy if you choose not to bring your own. 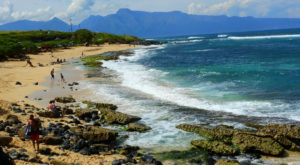 Poipu was once named America’s Best Beach by Travel Channel and is easily the most popular beach on Kauai’s southern shore. This sheltered cove with a small boulder breakwater creates a protected pool-like area perfect for those learning to snorkel for the first time. We suggest heading to the right side of the beach for the best snorkeling opportunities. Located just 2.5 miles off the shores of Maui's Makena State Park is Molokini, all that remains of an ancient cinder cone that last erupted more than 230,000 years ago. It is also easily one of the most surreal snorkeling spots in the country, and maybe even the world. The crescent-shape protects snorkelers and divers from currents, waves, and wind. You’ll need to take a tour boat to get here, but it’s one experience you’ll remember for the rest of your life. On the Kona coast of Hawaii Island, a dozen miles south of Kailua-Kona, sits a picturesque bay with crystalline turquoise waters and epic snorkeling. 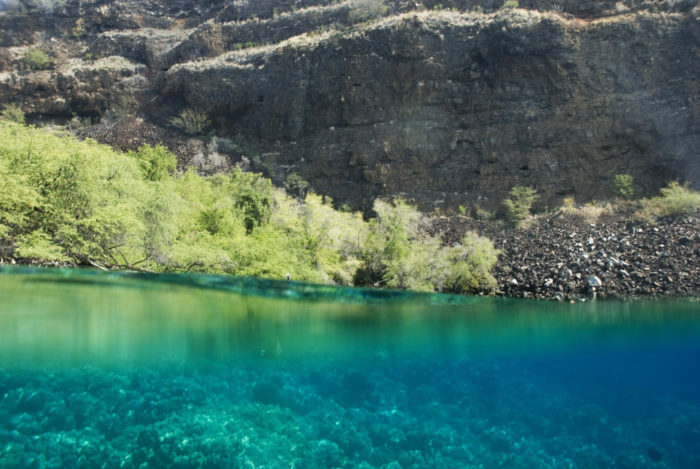 While Kealakekua Bay is no doubt absolutely jaw-dropping, it also happens to be one of the state’s most historic bays. The bay is also full of vibrant coral, schools of fish, and even, on occasion, spinner dolphins, making it one of the islands’ best snorkeling spots. Oahu’s north shore is known for its massive winter waves, but in the summer, the calm surf makes it an ideal location for getting up close and personal with sea life. 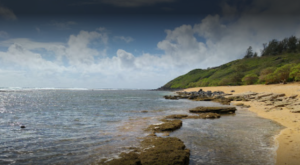 Located within Turtle Bay Resort on Oahu's north shore is this amazing little cove perfect for novice snorkelers to practice their skills in the summer months. Here, you will find tropical fish, a little coral, the occasional sea turtle — and some stunning views! 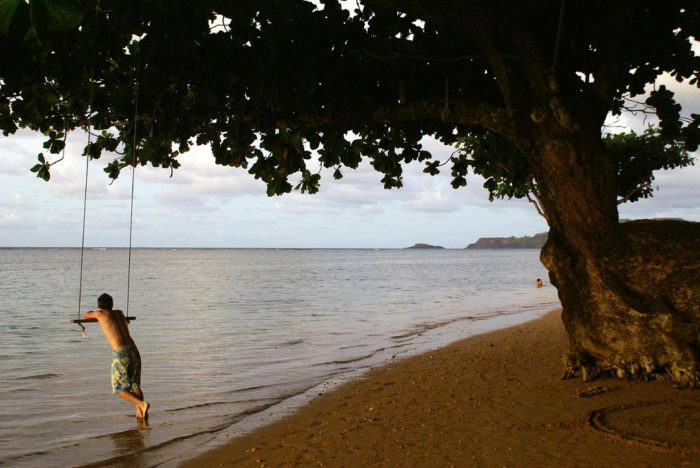 With shallow water and the largest reef on the island of Kauai, Anini Beach is a snorkeler’s paradise. The reef appears to stretch for miles, and exploring the reef’s underwater nooks and crannies is great fun for those of varying skill levels. 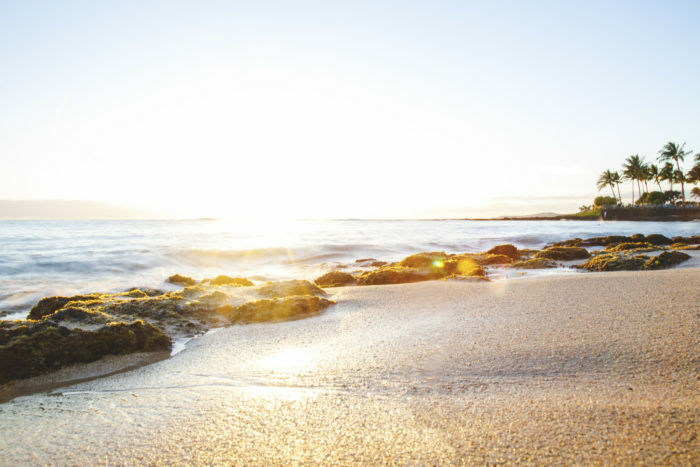 With swaying palm trees, golden sand, and calm waters, Kapalua Bay is what immediately comes to mind when you imagine the quintessential Hawaiian beach. Situated between two lava points, the protected bay is known for its tranquil surf, perfect for cautious swimmers and snorkelers. 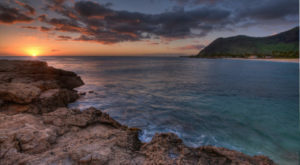 Perhaps the most popular tide pools in Hawaii, Kapoho consists of several interconnecting tide pools extending up to 200 yards offshore. 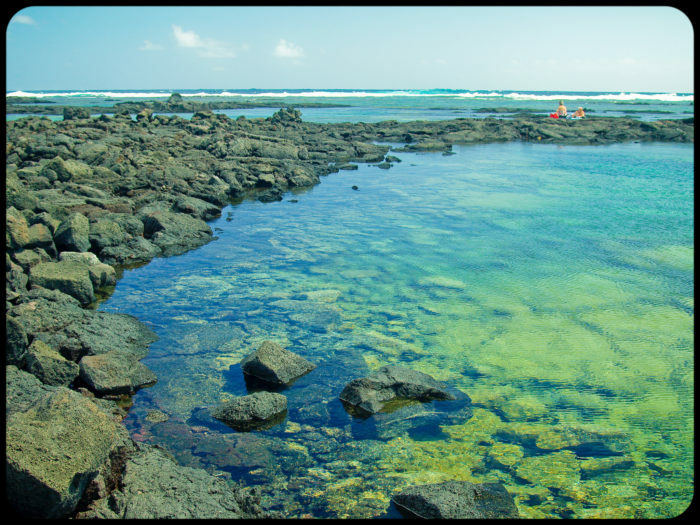 Many of the pools are large enough for snorkeling, and some of the pools are volcanically heated and can reach up to 90 degrees. 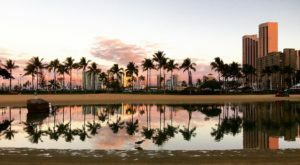 Worlds away from Waikiki Beach on Oahu’s western coast is Makaha Beach, a stellar snorkeling spot with clear, aqua blue water, underwater caverns, tunnels, and arches, as well as fish, octopuses, eels, dolphins, and sea turtles. This picturesque beach, located on Lanai’s southern coast, is the most famous stretch of sand on this small island. 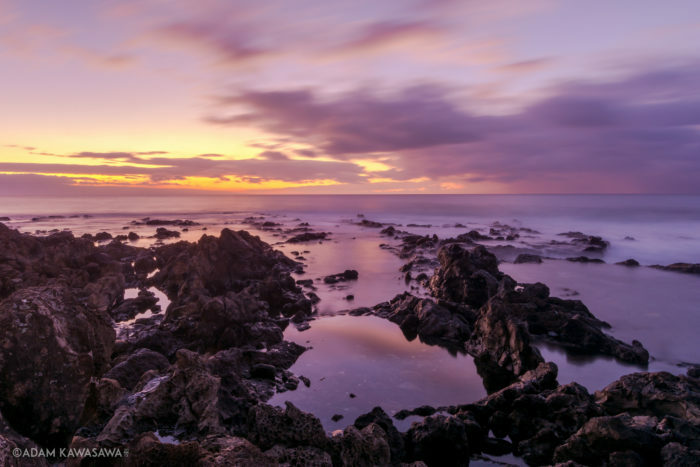 This protected beach offers ideal swimming and snorkeling conditions, and, during low tide, the eastern side of the bay is home to several large volcanic rock tide pools full of sea life. 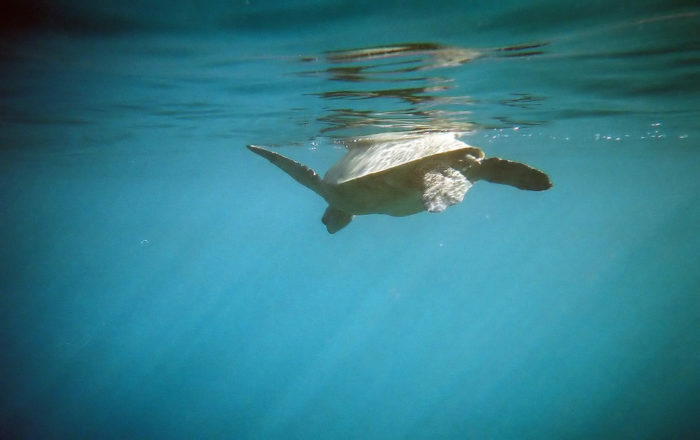 Further offshore you might find sea turtles and dolphins! 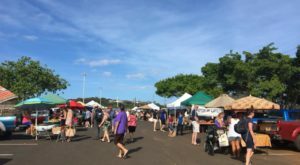 While there are several incredible places to hang out with sea turtles along Maui’s coastline, there is one spot, found along the southern shore of the island, that is hard to beat: Turtle Town. 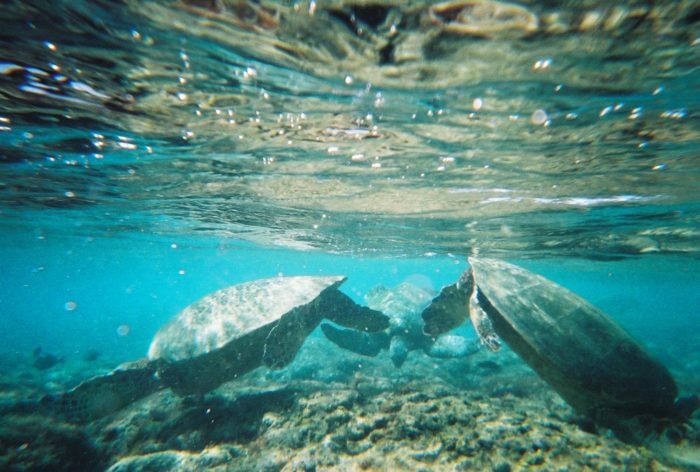 As its name suggests, Turtle Town is home to not only incredible coral formations but a large population of sea turtles. 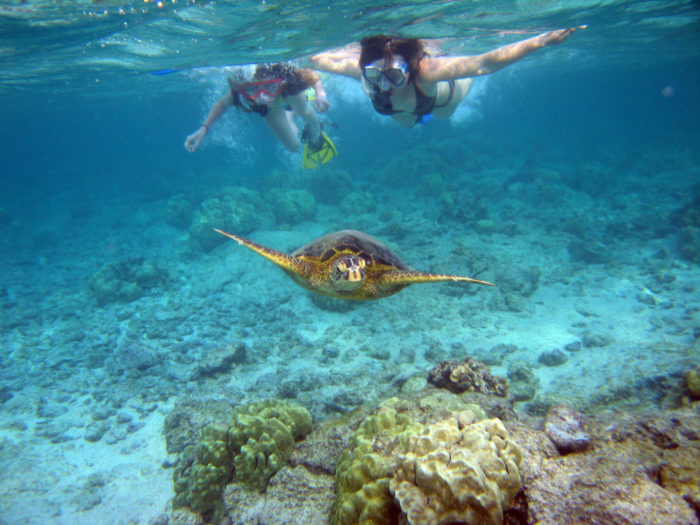 Most Maui snorkeling excursions stop at both Turtle Town and Molokini Crater, so you’re almost guaranteed some time spent swimming with the sea turtles, but you can also grab your snorkel and venture out on your own in hopes of checking an epic experience off your bucket list. 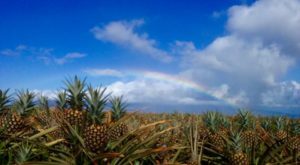 Located in Haena State Park, Ke'e Beach marks the end of the Kuhio Highway, the furthest you can drive on Kauai's north shore. A protected reef makes this an idyllic spot for snorkeling and swimming during the summer. 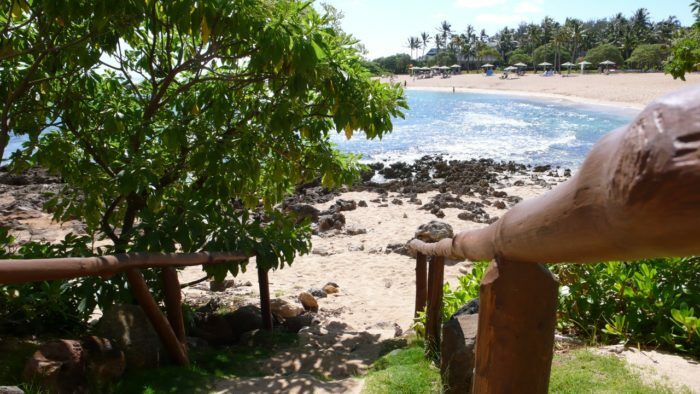 Located in Kailua-Kona is Kahaluu Beach, perhaps the Big Island’s most popular snorkeling spot. 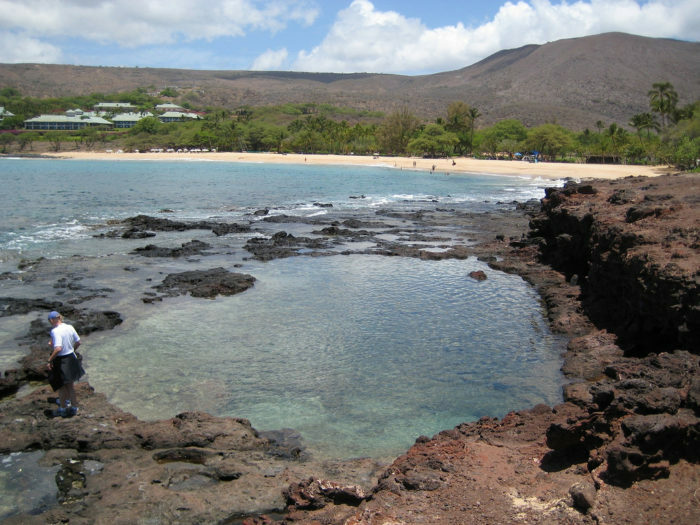 This tiny, sheltered cove is home to a wide variety of fish, as well as green sea turtles. Many even argue that it rivals some of the dedicated marine preserves you’ll find in Hawaii, and with so many stunning fish that are oddly comfortable around humans, we might have to agree. More into sunbathing and beachcombing than you are snorkeling? 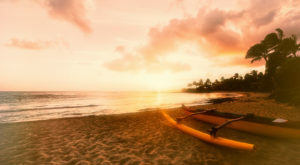 Check out our Hawaii beach bucket list — it will make your summer epic!